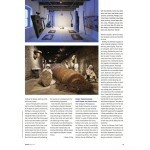 Take a look at the review section of this month’s Sculpture Magazine to see work by Andi Steele. The Magazine reviewed her recent installation, Emanate, on view in the Brossman Gallery at York College of Pennsylvania. 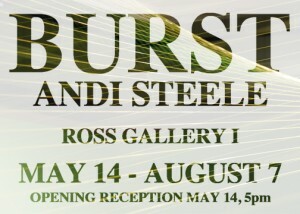 Her solo exhibition, Burst, will be on view in Ross Gallery I starting Wednesday, May 14. Join us for a reception May 14 from 5-7 pm. Andi Steele, an associate professor of sculpture at UNC Wilmington, creates site-specific installations involving brightly colored monofilament wire that she strings across spaces. 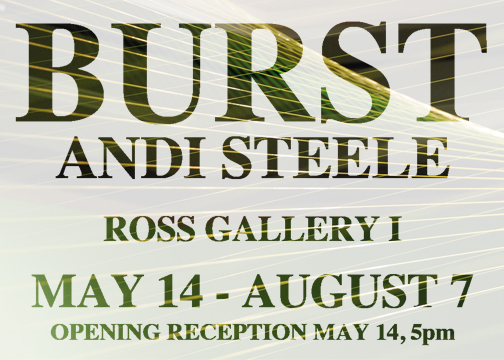 She designed her piece “Burst” around the front window of Ross Gallery I, an area usually used to frame and showcase art hanging in the gallery. When visitors look through the window, they will see little: a few lines and a little color. The whole of the work cannot be experienced without going into, and interacting with, the altered space. 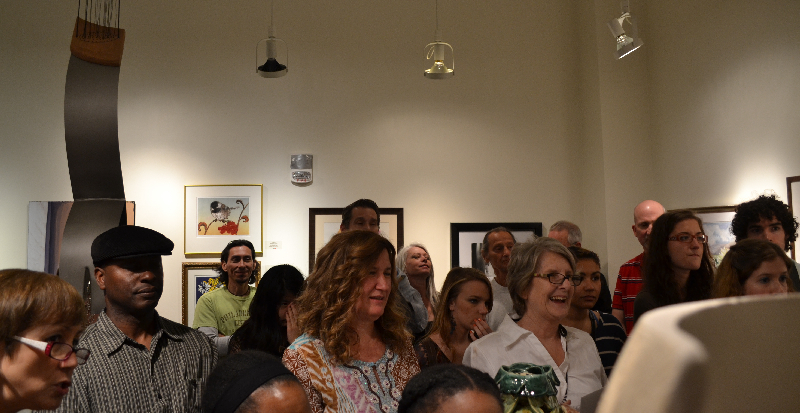 Steele encourages guests to walk in, look up, sit down, move through, look around and find their place. San Francisco artist Kirsten Tradowsky makes paintings of items found on Craigslist – tender, earnest depictions of objects that once were valued but are now forsaken, their owners bored with them, dead or in need of money. Together, these paintings of dishes, puzzles, recreation equipment and other objects constitute a catalog of abandoned dreams. The centerpiece of the show is “Reunion.” In this mirror-image diptych, crystal swan candy dishes, decorative boxes, pitchers and other sentimental doodads are arrayed on a table in a way that resembles a display of wedding gifts. But this coming together is really a taking apart, a final gathering of once-cherished items that will be dispersed forever. 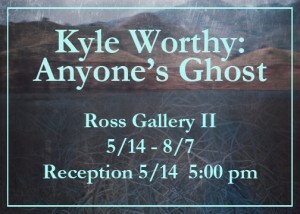 The show is on view through July 3. 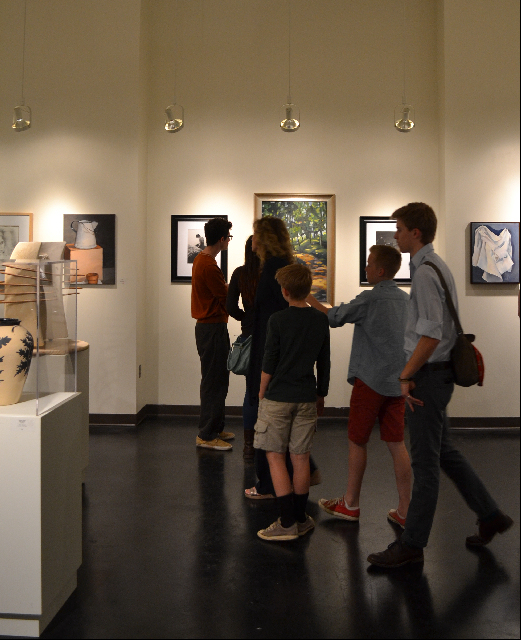 Thanks to everyone who came to the student show reception last Thursday night. 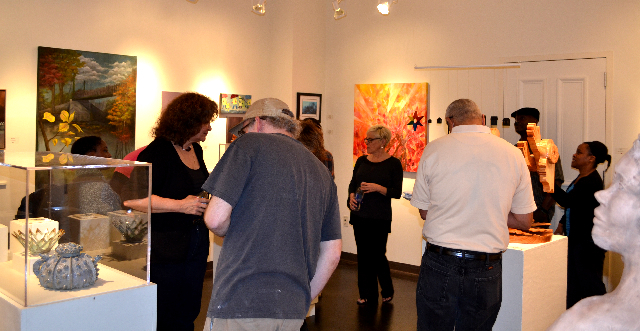 It was quite a party, with more than 250 attendees! The celebration was proof of both the number of successful students in the CPCC program and how many people support them. A special thanks to Richard Zollinger, Vice President for Learning and Workforce Development, for handing out awards, as well as Cato Campus Dean, Janet Malkemes, and Levine Campus Dean, Edith McElroy, for announcing awards on behalf of their respective campuses. A list of awards is below, followed by a few images of the reception and Award Ceremony. 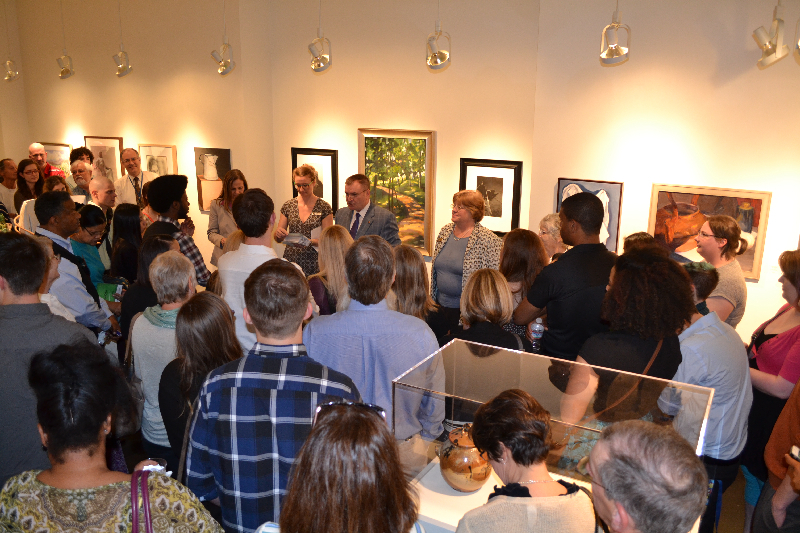 Congratulations to the many talented Visual Arts students here at CPCC! Pearson Publishing Textbook Cover Award, Decided collectively by CPCC Art Appreciation Teachers, to be published on the cover of the Art Appreciation textbook. 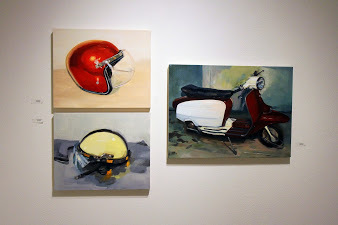 Take a virtual tour of Past Perfect: Kirsten Tradowsky, on view now in Pease Gallery.